PRINCETON, N.J. -- A majority of Americans continue to believe that political leaders in Washington should compromise in order to get things done, while less than half as many say leaders should stick to their beliefs even if little gets done. These attitudes are particularly relevant to the current situation in Washington, where Senate and House members face a Sept. 30 deadline to pass a stopgap budget resolution to avoid a government shutdown. Although Congress' job approval ratings have edged up to 20%, they are still historically low and reflect Americans' general antipathy toward their elected representatives. Previous Gallup research shows that gridlock is the top reason Americans give for disapproving of Congress, and leaders seem to agree. President Barack Obama said in his latest weekly radio address, "This is America -- we can do anything. We just need a Congress that works as hard as you do. At the very least, we should expect that they do their jobs." 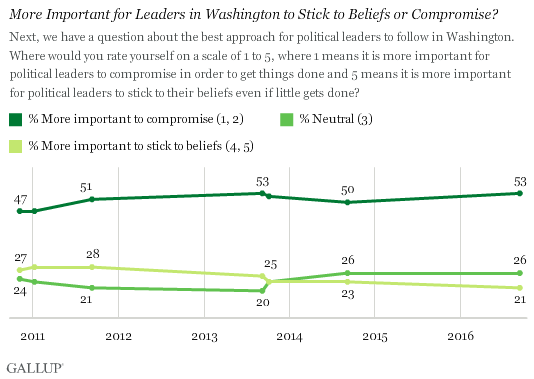 Gallup has asked Americans seven times since 2010 to indicate where they stand on this issue using a 1-to-5 scale, where "1" represents the belief that it is important to compromise in order to get things done and "5" represents the belief that it is important for leaders to stick to their principles even if little gets done. 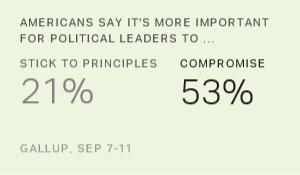 Americans have favored "compromise" over "sticking to principles" in each of these surveys, ranging from 53% this year and in 2013 to 47% when the question was first asked in late 2010 and early 2011. The current 21% of Americans who prefer that their leaders stick to their principles is the lowest Gallup has recorded; 28% in 2011 was the highest. Democrats and Republicans continue to look at this philosophic question through somewhat different lenses, although some evidence suggests that both partisan groups are shifting their positions. The current 56% of Democrats and Democratic-leaning independents who favor the compromise position is down from 67% in 2014 when Gallup last asked this question. Republicans and Republican-leaning independents, by contrast, have become somewhat more likely to favor compromise than in 2014 and less likely to believe leaders should stick to their principles. This means the gap between Republicans' and Democrats' preferences for compromise is smaller than it was in either 2013 or 2014. More Important for Leaders in Washington to Stick to Beliefs or Compromise? The reason for Democrats' and Republicans' shifts are not clear. Republicans' increased interest in compromise could reflect House Speaker Paul Ryan's apparent interest in passing legislation rather than holding out for specific provisions at all costs. It's also possible that in September 2014, when Gallup last asked this question, Republicans were focused on winning the Senate and attempting to limit Obama's influence and thus less interested in compromise. Rank-and-file Democrats could be less interested in compromise because of the possibility that it would be GOP presidential candidate Donald Trump with whom they would be compromising -- or perhaps because of the lingering influence of Bernie Sanders and his strongly held, uncompromising beliefs. Whatever their reasons, both Republicans and Democrats, by a ratio of more than 2-to-1, say they want their leaders to compromise rather than stick to their principles. Americans continue to want their leaders in Washington to find a way to compromise and get things done rather than hold out for what they believe at the cost of inaction. Both presidential candidates appear to agree. Trump has said that when dealing with Congress, he would get everyone together in one room and get them to act for the good of the people. Hillary Clinton has pointed out that "the tendency to put ideology ahead of political progress [has] led to gridlock in Congress." The data show that more Democrats and Republicans would agree with these sentiments than would disagree. Of course, when either Trump or Clinton wins the presidency, how much Americans who identify with the opposite party will actually want their representatives to compromise and go along with the new president remains to be seen. Americans name the economy, dissatisfaction with government and unemployment as the greatest problems facing the U.S. Americans trust the GOP (42%) slightly more than the Democratic Party (38%) to handle the most important problem. Americans' trust in the mass media has dropped sharply since last year to its lowest point since 1972. Republicans' lack of faith in the media is chiefly behind this decline.